SANTA FE SPRINGS >> Whittier High School could have pouted after losing to Santa Fe on Wednesday. Instead, the Cardinals got mad, and they are back in the Del Rio League baseball race because of it. Nick Viramontes and AJ Esquivel combined on a five-hitter Friday and Whittier pulled into a first-place tie with the Chiefs and California with a 2-1 victory at Santa Fe High School. Christian Soto had two hits for the Cardinals, who improved to 11-15 overall and 7-4 in league play. Santa Fe slipped to 12-13 and 7-4. California, which beat La Serna, 1-0, on a shutout with nine strikeouts by Jakob Farmer, is 13-9 and 7-4. The three have completed their season series against each other. 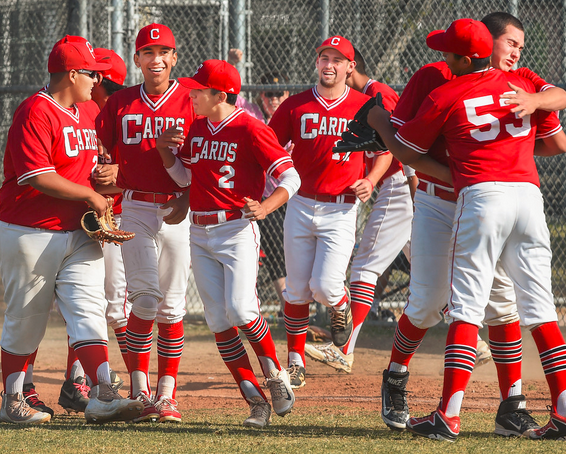 Whittier earned it’s spot after rebounding from a 9-1 setback to Santa Fe on Wednesday. Santa Fe was denied Friday after loading the bases twice with less than two outs during the final three innings, including in the seventh. But Esquivel, who gave up a pop single after replacing Viramontes with one out and runners on first and second in the seventh, saved the day. He struck out Luis Aguilar before inducing Robert Lucia to ground out to first get the victory. Schurr 14, San Gabriel 1 — Karen Roman was the winning pitcher and went 4 for 4 with two RBIs to lead the Spartans (15-4, 5-1) to the Almont League win. Schurr compiled 14 hits. Marissa Fernandez went 4 for 4 with an RBI and Jazmine Ayala went 2 for 2 with a triple and three RBIs. SANTA FE SPRINGS >> That showdown for first place in the Del Rio League never materialized on Thursday. 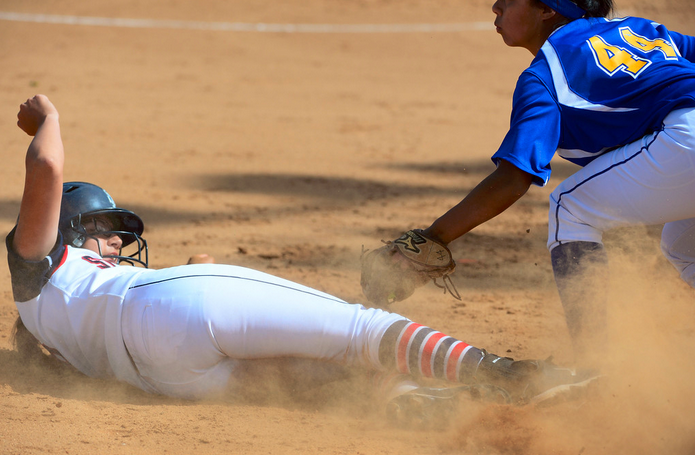 California, one of the hotter softball teams in the area, dominated from the start. Justice Sharp had two RBIs and threw six shutout innings, and the Condors took advantage of five errors by host Santa Fe to score a 12-0 victory. 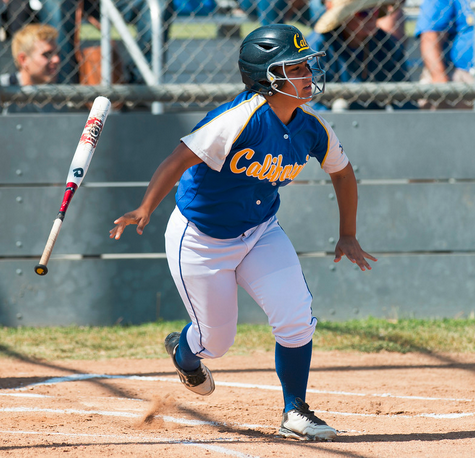 Sierra Rodriquez had three hits and Jaclyn Macias and Nautica Rivera had two RBIs each for California, which improved to 12-11 and 5-0 in league play. Sharp gave up five hits and struck out two. Santa Fe, which had won five of six, slipped to 11-10 and 4-2. Cal, which is at La Serna Friday, holds a two-game lead in the loss column over Santa Fe and La Serna with two weeks left in the season. Cal jumped out early, taking a 3-0 lead in the first. Sarah Duran led off with a single before taking third base on a double by Marina Tamayo. Sharp then doubled to center field with two outs for a 2-0 lead. Rivera then followed with a single to right field for the three-run lead. The Condors pushed it to 5-0 in the third on a walk, an error and a two-base throwing error. They blew it open in the seventh with seven runs, highlighted by a two-run home run by Skiela Martinez. Santa Fe 13, Pioneer 5 — Alexandria Andrade was the winning pitcher, Jeanelle Medina went 5 for 5 with a double and Alexxis Ponce went 3 for 4 for the Chiefs (11-9, 4-1) in a Del Rio League win. Samantha Mancillas had a triple for Santa Fe. Whittier Christian 3, Maranatha 0 — Cade McGee had seven kills and four digs, Justin Osborn had six kills, three digs and five assists and Josh Sorely had four kills and two blocks for the Heralds (3-3) in a 25-21, 25-14, 25-19 Olympic League win. SANTA FE SPRINGS >>strong> Bishop Amat High School was in position to possibly clinch the Del Rey League softball title on Tuesday against rival St. Paul.The Swordsmen said no, not at their place. Kayla Rivas had the go-ahead RBI in a three-run fourth inning and Emilee Leonard was steady in the circle to lead St. Paul to a 3-2 victory over Bishop Amat at Jersey Fields. Leonard and Nia Carter also had RBIs in the fourth inning for St. Paul, which improved to 14-8 overall and into second place in league play at 5-3. Leonard gave up eight hits and struck out six. Gabby Bracamonte went 3 for 4 with a RBI and Alyssa Barrera had a double and a triple and scored a run for Bishop Amat, which slipped to 17-3 and 7-1. The Lancers’ Samaria Diaz had given up one hit through the first three innings before the Swordsmen solved her in the fourth with fourth singles for a 3-1 lead. The Swordsmen put runners on first and second with one out of a single by Samantha Rivas and a hit by pitch to Sydney Kreimann. Leonard then tied it 1 with a single to center field. Kayla Rivas and Nia Carter followed with back-to-back singles to center to push it to 3-1. Leonard then survived a scare in the seventh. Sophia Saucedo and Bracamonte had singles before a RBI groundout by Maddie Ramirez cut it to 3-2 with two outs. Leonard then induced Julia Valenzuela to pop out to end the game.